Resident mixologist Melissa Bruno shakes up a summer classic made fresh for you. A little salt around the rim, a touch of lemon-lime, a dash of sweetness and a big tequila bite—it is simply amazing how something so unpretentious can taste so delicious. Margaritas are a summertime staple and tend to evoke thoughts of white sandy beaches, crystal blue waters and cabana bars in every sip. And the history behind this sweet and sour concoction is just as provocative. The origin of this cocktail is actually unknown. While there are several versions and many people who want the claim to fame of creating the first mixed drink containing tequila, no one has been able to pinpoint the true story of its origin. But at least each story makes for good conversation over a round or two of these salt-rimmed sparkling drinks, which according to "Cheers, an On-Premise Handbook," was the most popularly ordered drink in 2009, representing 18 percent of all mixed drink sales in the United States. A personal favorite – and the most accepted story – is about a Dallas socialite, named Margarita Sames, whose favorite party game was to duck behind the bar and mix up random combination drinks for her guests with whatever bottles of liquor her hands fell onto. During a 1948 Christmas party at her vacation home in Acapulco, Mexico, she threw together tequila, Cointreau, and lime juice. It was said to be a big hit at the party and her friends brought the recipe back to the states where its popularity spread like the soft shell taco. According to a 1994 interview in the San Antonio News-Express, Sames hung up her bar key and retired on the 45th anniversary of the cocktail. However, an equally convincing story behind the invention of the Margarita involves a showgirl named Marjorie King, who was allergic to all alcohol except tequila. In 1938, King was visiting the Rancho Del Gloria Bar in Rosarita Beach, Mexico, when she asked one of the bartenders to make her a cocktail with tequila. The bartender, a chap by the name of Danny Herrera, poured tequila over shaved ice and then added lemon and triple sec. He translated Majorie's name to its Spanish equivalent, Margarita. The third most commonly told tale comes from Tommy's Place in Juarez, Mexico. Pancho Morales was working the bar in 1942 when a woman came up to him and ordered a drink called a Magnolia. Morales could not remember what was in a Magnolia, except Cointreau. So – like many bartenders – he decided to fake it. After mixing Cointreau with tequila, he named the new concoction after another flower, the daisy. I bet you a Margarita that you can guess what "daisy" is in Spanish! Nonetheless, there are other bars that claim the origin of the Margarita with other tales to tell. It is hard to beat a chilled or frozen Margarita in front of you on a hot summer day, whatever story you choose to believe. But it should be noted that since its inception, Cointreau has largely been replaced by its cousin, triple sec. Why? Mainly because triple sec is cheaper to use and still achieves the desired taste. And much like its history, the cocktail itself has an array of different versions. Go to any Mexican restaurant worth the salt on the rim of your glass and you will probably be overwhelmed with decisions when you order a Margarita. Regular or Cadillac? Made with well or premium tequila? How about a mango, peach, or strawberry Margarita? On the rocks or blended? Salt or no salt? It is enough to make your head spin – and you have not even gotten your drink yet! As a bartender, I suggest a regular Margarita, made with premium Tequila, on the rocks, with salt. However, on an especially hot day, a blended frozen Margarita is the way to go. 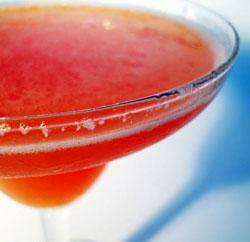 And if you are not feeling that sweet and sour flavor, definitely try a flavored Margarita. I suggest strawberry with no salt. According to "Cheers, The On-Premise Handbook," a collection of statistics on everything alcoholic, on average, Americans consume 185,000 Margaritas per hour. At this rate, you can try a Margarita every which different way. "The Handbook" also reports that the U.S. is the number one tequila market— even larger than Mexico. Respectively, the Margarita machine has also gained recognition. The first Margarita machine, which was created as a modified soft serve ice cream machine in 1971, has landed a permanent home in the Smithsonian's National Museum of American History. The machine will be featured alongside other interesting American inventions, such as Tupperware and a Krispy Kreme Ring King. OK, I think you have waited long enough for it: here is a general classic Margarita recipe. The recipe is for an on-the-rocks Margarita, but if you prefer a frozen Margarita, just toss everything into a blender and enjoy. Also, if you want to dabble with flavored Margaritas, stop by your local grocery store and pick up any mixed drink flavoring you like (these are usually found in with the drink mixes and teas). Rub the rim of a Margarita glass with lime and dip the rim of the glass into salt. Gently shake the glass to get rid of any excess salt. Grab a Martini shaker, fill with ice and add in the Tequila, Cointreau/Triple Sec and Sours. Shake it like your Mama taught you. Pour the mix (ice and all) into the Margarita glass. Add lime wedge to the rim and Olé!